Berggruen Gallery is pleased to present an exhibition of new paintings by Michael Gregory. 1000 Words marks Gregory’s twelfth solo exhibition at the gallery, and will be on view May 18 – July 1, 2017. The gallery will host a reception for the artist on Thursday, May 18 from 5:00–8:00 p.m. The landscape of the American West is a subject that has long captivated artists both past and present—its iconic symbolism is pervasive and is as debated as it is celebrated. As Gregory writes, “America has always been an idea, a construct of our imagination, and our imagination has outdistanced even its vast boundaries and empty places. The American West has provided us a rich metaphor for a discussion of our hopes, aspirations and failures. It is the subject of literature, poetry, and song—part of our American common language.” Gregory’s bucolic landscapes so elegantly evoke this character of the American West, conveying an appreciation for the continent’s beauty and its vastness. Immersion in nature is a fundamental quality of humanity, one might say, because it connects us to this ideal and to history as embodied by the American West. The road trip is one such means by which we experience the American landscape, and it is via road trips that Gregory gleans content for his paintings. His journeys through the West, Midwest and Hudson Valley have inspired Gregory and his subject matter. “These paintings,” Gregory states, “are visual composites of these trips, re-imagined and re-constructed in the studio. Images are assembled on the canvas much like one would compose a still life. They are by their conception and resolution fictive places, but places we are from and hope to return. I would like to evoke in the viewer an experience of America’s vast reservoir of space, distance, solitude, loneliness and yes, beauty.” In his studio, Gregory often works on a number of paintings at a given time. They establish in this manner a dialogue in which one may suggest a solution for another. This dialogue, Gregory hopes, also extends outside the studio to the viewer. 1000 Words, inspired by the well known adage, speaks to the ability of painted imagery—a kind of language in and of itself—to expand written vocabulary. That is, the formal structure of a painting becomes a vehicle by which to access shared memory and experience. The crux of Gregory’s paintings in relation to the vast oeuvre of American landscape painting lies in their signature subject matter—barns and silos painted in pristine and intricate detail against broad plains and mountains. These archeological sites call to mind remnants of lives once lived, eternally frozen in time. Gregory’s creations are a new genre of landscape portraiture, in which barns and buildings reflect and encapsulate the people who built them; indeed they are reminders of them. Gregory notes that so frequently descriptions of the American West romanticize and eulogize the landscape and its beauty. However, he observes, “our pastoral yearnings are far from the reality of an unforgiving landscape and the hard life on the range. The West is littered with buildings that are reminders of this struggle. 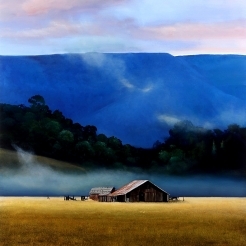 For me, landscape is a metaphor; it is the stage where all human drama takes place.” Gregory’s landscape portraits—solitary barns nestled amidst colossal mountains, swallowed by a sea of grain, or showered by a heaven full of stars—pay homage to the human actors whose lives played out against the backdrop of the American landscape. Crows Heart, with its dark looming mountains, speaks to man’s frailty and insignificance in the face of nature or the vastness of the earth and cosmos. Michael Gregory: 1000 Words, May 18 – July 1, 2017. On view at 10 Hawthorne Street, San Francisco, CA 94105. Images and preview are available upon request. For all inquiries, please contact the gallery by phone (415) 781-4629 or by email info@berggruen.com.